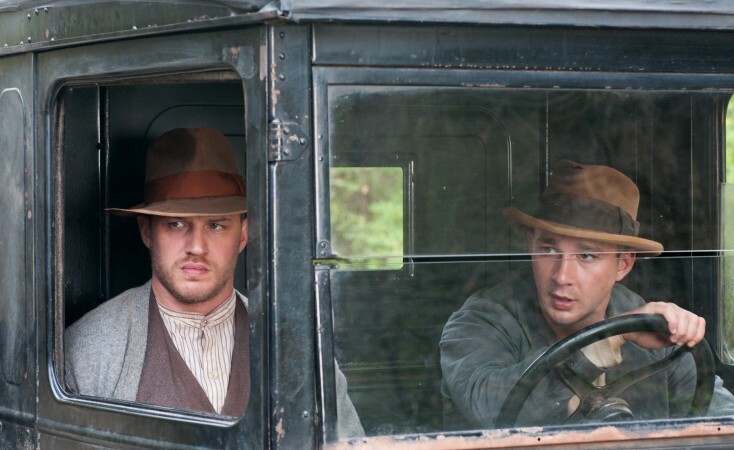 (L-R) TOM HARDY and SHIA LaBEOUF star in “LAWLESS.” ©Richard Foreman, Jr., SMPSP/The Weinstein Company. HOLLYWOOD—Musician/writer Nick Cave’s image may be that of a sometimes intensely grim performer who has fronted the Bad Seeds since the 1980s, released a 1996 album titled “Murder Ballads” and was described as a “harbinger of the gothic psycho-sexual apocalypse” in an NME review of his 2008 CD “Dig!!! Lazarus Dig!! !” But appearing at a press junket for the new movie “Lawless,” the unexpectedly affable Australian was funny, animated and genuinely seemed to be enjoying himself. Entering a room full of journalists, the dark-browed Cave jokes, “Oh, I didn’t bring my answers!” Sunglasses dangle from his half-unbuttoned purple-striped shirt. His black blazer matches his straight, slicked-back hair. A large gold bracelet watch completes his vampire high-roller ensemble. Cave notes that he originally had no interest in “doing someone else’s story,” but was convinced to adapt Bondurant’s bestseller because it had the kind of elements that appeal to him and Hillcoat: “filmic lyricism” and “brute violence.” “Lawless” is the fictionalized account of three moonshine-making brothers who plied their dangerous trade in rural Virginia during the Prohibition era. He still regards moviemaking as an extracurricular interest and music as his career. “I think that scriptwriting of anything is a craft, in the sense that you’re really a functionary that’s serving a greater machine, and your heart and soul is not even really wanted,” he says. With the exception of dropping a plot about a contemporary writer doing research, Cave says his first draft of “Lawless” was very faithful to the book. Tom Hardy, who was the occasionally unintelligible villain Bane in “The Dark Knight Rises,” plays the gruff Forrest Bondurant in “Lawless” with a sometimes similar mush-mouthedness. Cave notes that some of Hardy’s frames of reference at first seemed bizarre to the filmmakers. During rehearsals, he says Hardy mentioned “wanting to play Forrest like an old lesbian. And we’re kind of like, ‘Okay…’ And then at another point, he said, ‘Actually, I’ve changed my mind. Now I want to play it like the little old lady in Tweety-Pie. You know, like Sylvester and Tweetie-Pie, that’s who I want to base this character on.’ I’m like, ‘Okay…'” Cave says the choices ended up making sense because Forrest is a matriarchal figure trying to hold his family together. The film’s eclectic score includes two unusual versions of Lou Reed’s “White Light/White Heat,” one a country ramble by Cave and others as The Bootleggers, and the other a quietly stripped-down rendition by bluegrass legend Ralph Stanley. “Ralph had heard our versions of ‘White Light/White Heat’ that we’d played, and we wanted him just to sing on top of these versions,” Cave says.